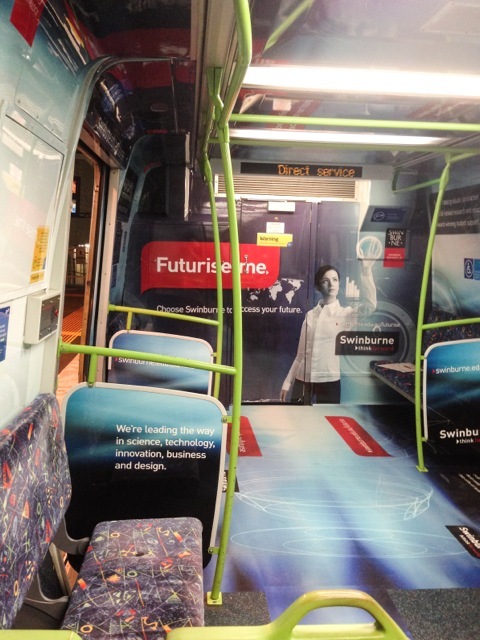 Women targeted agency, Venus Comms and ad agency S&J Media have launched an exclusive interior ‘train wrap’ for Swinburne University of Technology, as part of the university’s ‘Futurise me’ 2015 undergraduate recruitment campaign. Installed by S&J Media, the wrap was revealed on Melbourne’s north-eastern train lines, and is a first in outdoor advertising. The piece was developed to embody Swinburne’s philosophy of innovation, and reveals agency Venus Comms dedication to producing campaigns that push limits and engagement. Developed in line with Swinburne’s successful ‘Think Forward’ positioning, the complete interior of the train ­– including walls, roofs, flooring, doors and seats ­– has been skinned to look as if it is from the future, immersing students in ‘tomorrow’ with every journey. “The completely remodelled interior immediately impacts the commuter upon boarding the train, as if they are truly stepping into the future,” he added. The ‘Futurise me’ train wrap will run until December 22.